How about that gun show? Yes, your intrepid reporter has once again ventured into the very jaws of evil and wickedness, the gun show. 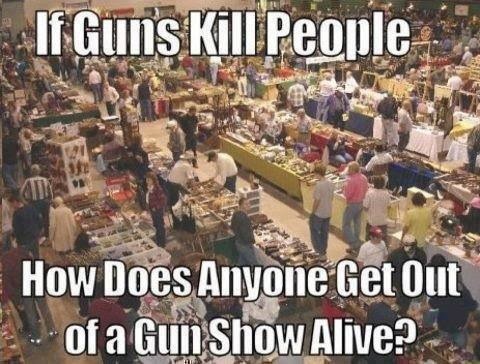 This one was the Concord, NC, Gun Show featuring the NC Gun Collectors Association. I always try to get to shows where the NCGCA is going to put in an appearance, because they have such cool stuff to look at. I'd never seen harpoon guns before. Amazing things, harpoon guns. And I made it out alive, and with encouraging words of ammo availability and lower prices (on some items, you mileage may vary, void where prohibited by statist bastards). Oh, and I did buy a gun, as if that is a surprise. The good news is that AR prices, along with the prices for the parts to roll your own. Ammo, in what I think of as "the standard calibers" of 9 mm, .40, .45 ACP, 5.56/.223 and 7.62 x 51/.308 were in very good supply from various manufacturers at prices approaching pre-panic levels. That's not bad when you consider how much the dollar has inflated since then. Even .22 LR was available, although not in great quantity and at pain-inducing prices. Components were also present, although powder was still somewhat hit or miss. It was there, but not in large quantity. Prices were reasonable for the most part, with bullets being the most expensive items I bought. The bad news is that in the less popular calibers, such as .380, .38 Special, .357 and .44 magnum, 8mm and so on are still hovering around nose bleed territory for reasons indeterminate. .44 magnum, which I was especially interested in, was difficult to find and when found was $35-40/box. I took a pass and bought components instead. I've got powder and primers, it was brass and bullets I was lacking. And time, always time. Oh, and the gun (and the reason for the .44 magnum search in the first place). For some reason I've been on a bit of a magnum kick for some while. You may remember that back in February I bought a S & W Model 69 Combat in .44 Mag. I have a habit of wanting some sort of long gun in each pistol caliber I'm serious about, and I've been looking for one for a while. I finally found one of the ones I considered acceptable, a Henry Big Boy chambered in .44 magnum. Nice gun and the price only hurt when I counted out the money. If we get a non-rainy evening, I want to get it to the range and see if it performs as nicely as it's built. It hasn't rained in nearly a month and what happens when I get a new gun? It monsoons!